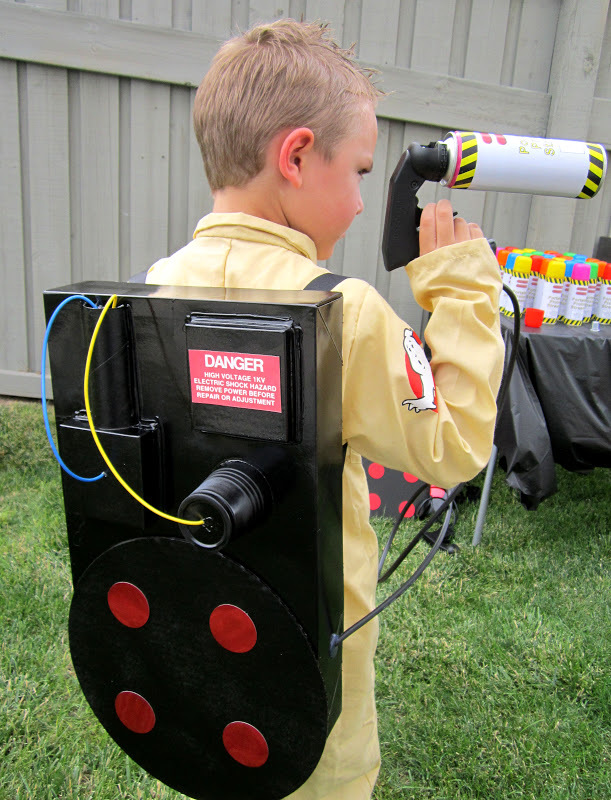 Have A Ghostbuster Party This Halloween! Halloween is all about the classics (Frankenstein, Dracula, Bride of Chucky, The Mummy etc) and one of the greatest horror comedy classics ever is Bill Murray’s Ghostbusters. You can’t go past the green slime, dirty ghosts and crazy cool fire station as a base! Plus, as Emma Stone said in Zombieland, Bill Murray just gets me! 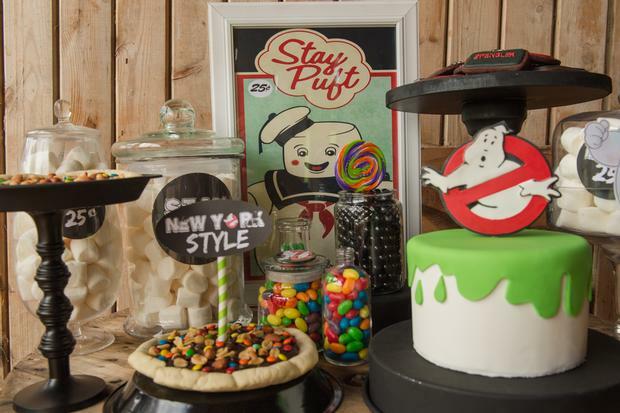 This dessert table is the highlight of the party and uses the classic feel of the Ghostbusters movie as an amazing jumping off point for the decorations! The venue seems to be a cute vintage style wooden shed or back room and Hostess played it up by using antique style chalk boards as signs for the food, and used a white washed vintage photo frame to showcase a drawn photo of the Stay Puff Marshmallow Man as the centrepiece. A few cool food ideas that you can serve to your guests can include New York Style pizzas, hotdogs with pesto sauce on it (to create a slime effect! ), green jelly (again to go for the slime! ), Marshmallows in glass jars in homage to the Stay Puff Marshmallow Man and Ectoplasm green drinks (it’s really a wheatgrass health drink!). The birthday cake here is absolutely amazing and very simple in design! Create a one tier birthday cake and wrap white fondant around the outside. Then, use a lime green fondant and cut out in dripping patterns over the top to create the slime effect. It’s simple, and very effective! You can buy Ghostbuster symbols online and use as a cake topper for the birthday cake to tie everything all together. Love it! There are heaps of different games and fun things you can do at a Ghostbuster Halloween party as well. Sweeten Your Day Events created Ghostbuster Containment Proton Packs out of cardboard and black spray paint and used silly string as the blasting weapon. If you don’t want the kids to attack you with the silly string (though it will probably happen anyway!) set up some “monsters” around the garden for them to attack ala the Ghostbusters. You can also set up a create your own slime station and use it as a gift for all the guests to take home at the end of the day. 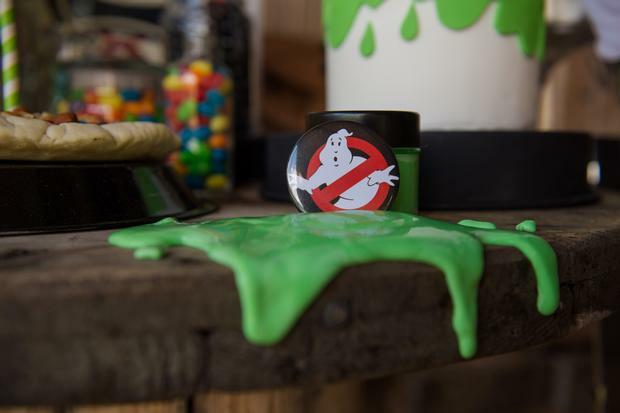 Stick the Ghostbusters logo on top of the jar to give it a more authentic feel, and whatever you do, make sure it’s green! 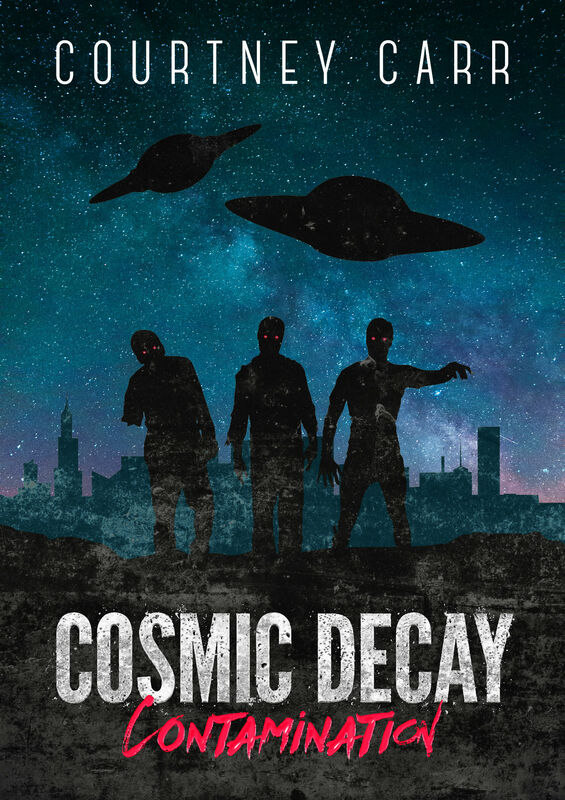 You can get some recipes for making radioactive slime here. 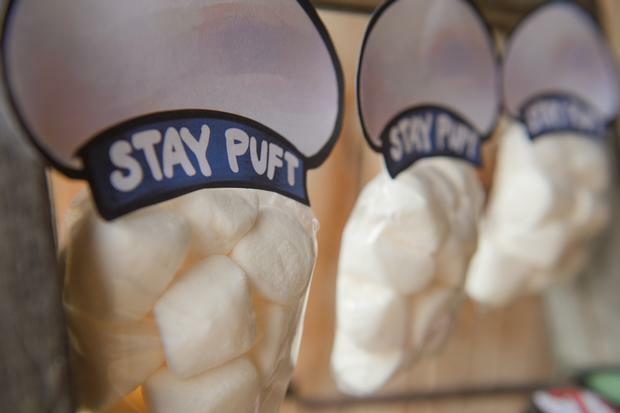 And while we are on the subject of gifts for the guests, set up a little take home pack of soft marshmallows and draw a little Stay Puft hat out of cardboard to stick to the top of the bag. Delicious, and gives a nod to the cutest villain ever! And, as usual with parties suggested by The Party Connection, it should always be a dress up party! 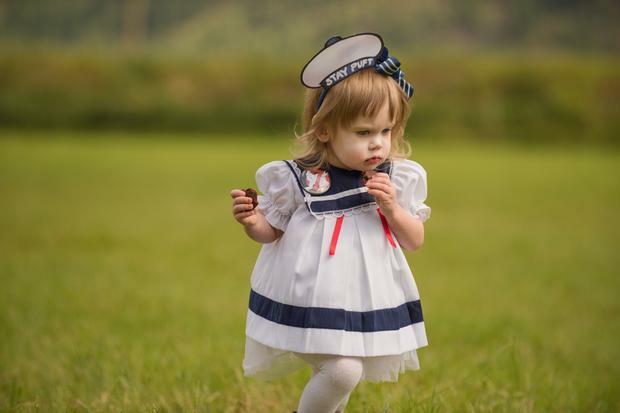 Dress up as the Marshmallow Man, a Ghostbuster or even a slimey monster! The choice is yours! 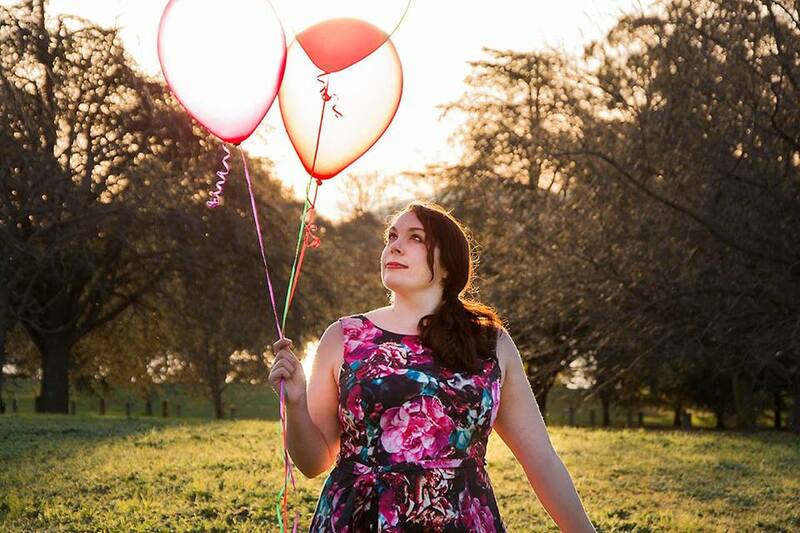 ← Have a Fifty Shades of Grey Bachelorette Party!